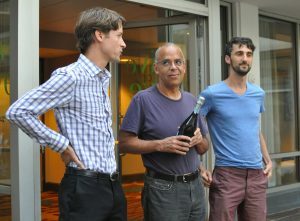 Bioinformatics, Birthdays, and Booze at Boston BOSC. Birthdays are always emotional. The GigaScience team are on their way back from the always jam packed ISMB meeting and its satellite SIGs. 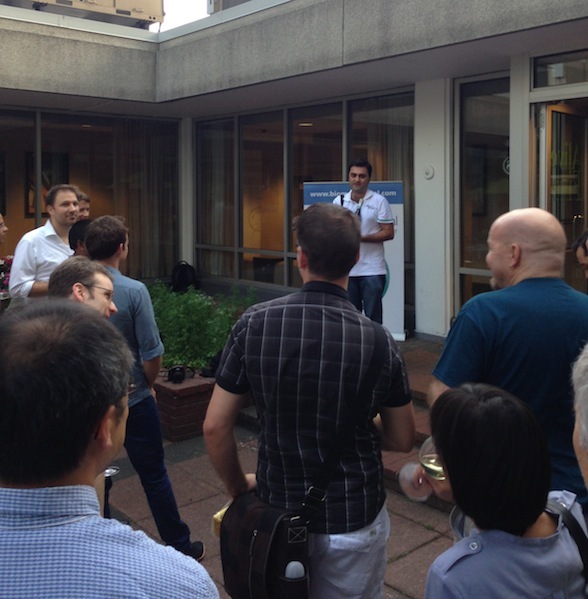 This year was a particularly event filled one, with our second birthday, the BMC open data award and drinks reception, and our “What Bioinformaticians need to know about digital publishing beyond the PDF2” workshop all falling during the meeting. The SIGs were brilliant as always, and we had additional involvement this year, promoting and building on our AFP (Advanced Functional Prediction) series tied in with the SIG of the same name, and sponsoring BOSC (the Bioinformatics Open Source Conference) for the first time, as well as presenting a poster there (see it archived here). BOSC had some particularly memorable keynote talks this year, particularly as thanks to a stasis leak, Titus Brown managed to discover and present a talk from his future self on a “History of Bioinformatics” from 2039 (see the slides and video). Whilst there are many pitfalls and tsunamis to come (both metaphorical and actual), it was pleasing to see that (after some turbulent times) bioinformatics has a bright future, and more open and reproducible research will become the norm. The seeds of this could be seen in the keynote on “Biomedical Research as an Open Digital Enterprise” by Phil Bourne (see video and slides), providing his insight as new NIH data Czar on where the world’s largest biomedical research funder is taking the research community. The vision and direction was exciting for all of the advocates of “open” in the audience, which for BOSC was obviously everyone. Specifically tackling and promoting “The Commons” for all research outputs (also touched upon by our board member Carole Goble in her talk on SEEK for Science), this is great news for those keen to leverage the most out of data driven intelligence. This may not so be so great news for those in the publishing industry promoting restrictive and uninteroperable licenses (e.g. CHORUS and the proposed new STM association licenses), or institutions such as the Broad moving away from open source tools who will find their efforts increasingly marginalized and siloed. Open approaches were also on display in the AFP-SIG, and on top of another keynote from Phil Bourne, Mark Wass (one of the editors of our AFP series) presented on crowdAFP, a community effort to annotate the Chinese Hamster Ovary cell line genomes. The main focus was specific open innovation challenge, the Second Critical Assessment of Function Annotation (CAFA2) challenge, with preliminary results presented at the meeting. Open Data For the Win! (again). 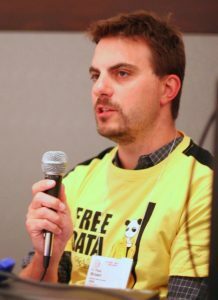 Sunday was our second birthday (see the report from last year), and to celebrate we debuted our brand new Bruce Lee/Kill Bill inspired “Free Data” t-shirts. For a conference usually renowned for its t-shirts, these possibly too much of a splash, with a feeding frenzy of people trying to grab the last ones disrupting part of our workshop (more on this in a follow up post). 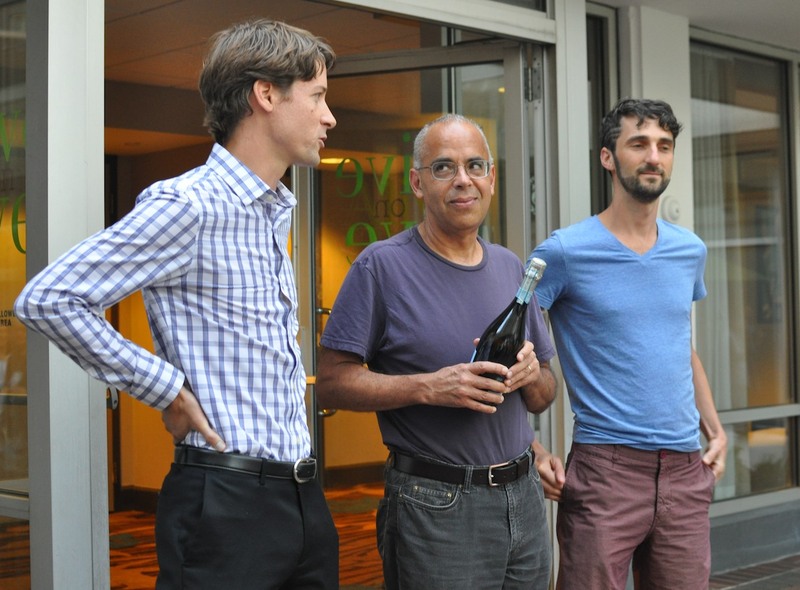 On top of having the coolest t-shirts at the meeting, we also hosted the coolest party, with 70 people join us at the Sheraton pool bar terrace to present the authors of our Assemblathon2 paper with the BMC Open Data Award. This is the second time one of our datasets has won (see our previous blog on the Genome Biology paper that won last year, that had data in GigaDB), and the award is a fantastic way of positively reinforcing and incentivizing good behavior and data sharing. While we brought the very popular t-shirts, LabArchives need to be thanked for sponsoring the sponsors of the event and award, and BMC for pulling everything together and lubricating the attendees. It was great to catch up with so many old and new friends and toast the success of the Assemblathon2 team. Unfortunately the main coordinators of Assemblathon2 Keith Bradnam and Ian Korf were unable to collect the award in person, but Adam Phillippy, David Jaffe and Shaun Jackman graciously accepted the Champagne on the other 90-odd authors behalf. We don’t really want to add to the mountains already said on how Assemblathon has changed views on genome assembly, or on what can be done regarding openness and transparency in peer review (Laurie’s video in biome does a good job on this), but the open data aspects of the project have been less covered and equally important. With clever use Amazon cloud and open access to all of the input datasets during the competition, access to the entries and judging data during the review process, and eventual archiving of these all after publication in our GigaDB database, it sets a very high bar for future projects to follow, and was an easy choice for the 2013 award by the judges. The impact can easily be seen at BOSC, when Titus’s talk from 2039 drew jokes about Assemblathon9. To save this posting getting any longer, in a follow up we’ll say more on our workshop and the main ISMB meeting, which was equally jam packed and memorable.